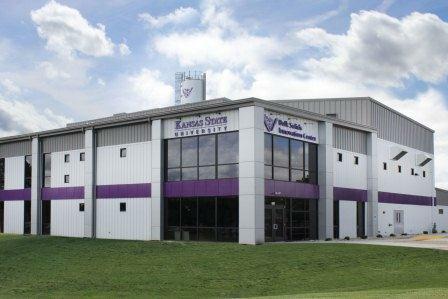 The Kansas State University Bulk Solids Innovation Center in Salina, KS provides professional development courses to further industry and employee education and help your organization operate at the optimal level. This is an introductory course designed for individuals who are responsible for bulk solids handling of materials. Covering various topics related to powders and bulk solids handling, individuals who enroll in this course will improve their ability to design, maintain, and improve bulk solids handling systems, understand advantages and disadvantages of the various types of systems, evaluate vendor options, and optimize the performance of existing systems. This comprehensive course provides theory and applied instruction on various bulk solids handling, storage, and flow concepts. Students will participate in a full-scale test laboratory practical session of bulk solids handling, focusing on dilute and dense phase pneumatic conveying. This course focuses on the design of pneumatic conveying systems, common pneumatic conveying problems and discusses solutions to these problems. Participants will partake in the actual design of pneumatic conveying system following step-by-step procedure. The course includes practical demonstrations and troubleshooting using various materials in actual pneumatic conveying systems. This course covers important topics related to powder and bulk solid flow in bins, hoppers, and chutes. Participants will participate in a full-scale test laboratory practical session on bulk solids handling. Participants will improve their ability to design, maintain, and improve bulk solids handling systems, understand advantages and disadvantages of the various types of systems, evaluate vendor options, and optimize the performance of existing systems. *Discounts available to multiple registrants from same organization and scholarships available to educational entities.